their college options carefully and have a clear preference for one institution. Early decision plans are binding—a student who is accepted as an ED applicant must attend the college. Early action plans are nonbinding—students receive an early response to their application but do not have to commit to the college until the normal reply date of May 1. Counselors need to make sure that students understand this key distinction between the two plans: binding is binding. About 400 colleges have early decision or early action plans, and some have both. Some colleges offer a nonbinding option called single-choice early action, under which applicants may not apply ED or EA to any other college. ED plans have come under fire recently as unfair to students from families with low incomes. In 2002 both Stanford and Yale universities replaced their binding early admissions programs with nonbinding early action plans. Print Early Decision Self-Evaluation Questionnaire for students who want to apply early, featured on page one of Deciding About Early Decision and Early Action, and encourage them to fill it out—you may want to share this with parents as well. Pressure to decide: Committing to one college puts pressure on students to make serious decisions before they've explored all their options. Reduced financial aid opportunities: Students who apply under ED plans receive offers of admission and financial aid simultaneously and so will not be able to compare financial aid offers from other colleges. For students who absolutely need financial aid, applying early may be a risky option. Time crunch for other applications: Most colleges do not notify ED/EA applicants of admission until December 15. Because of the usual deadlines for college applications, this means that if a student is rejected by her early-decision college, she will have only two weeks to send in other applications. Encourage those of your students who are applying early to prepare other applications as they wait to hear about admission. Senioritis: Applicants who learn early that they have been accepted into a college may feel that, their goal accomplished, they have no reason to work hard for the rest of the year. Early-applying students should know that colleges may rescind offers of admission should their senior-year grades drop. Does applying early increase the chance of acceptance? Many students believe applying early means competing with fewer applicants and increasing their chances for acceptance. This is not always true. Schools vary in the proportion of the class admitted early and in the percentage of early applicants they admit. Higher admission rates for ED applicants may correlate to stronger profiles among candidates choosing ED. Students should ask the admissions office whether their institution's admissions standards differ between ED and regular applicants, and then assess whether applying early makes sense given their own profile. The Common Application and some colleges' application forms require the student applying under early decision, as well as her parent and counselor, to sign an ED Agreement form spelling out the plan's conditions. Make it clear in your school handbook and at college planning events that your policy for early-decision applications is to send the student's final transcript to one college only: anything else is unethical. EA/ED program specifics vary, so students should get information as soon as possible directly from their first-choice college admissions staff. EA/ED applicants must take the October SAT and/or SAT Subject Tests in order for these scores to make it to the college in time. Print Early Decision & Early Action Calendar with students and parents to be sure they are aware of all the required steps for applying early. NYU offers two Early Decision application options for freshman applicants who are certain that NYU is their first-choice university. Students applying as Early Decision candidates will receive their admission decision after December 15 (Early Decision I) or after February 15 (Early Decision II). NYU's Early Decision programs are, in fact, binding agreements, whereas if an applicant is offered admission and provided with a financial aid package that enables the student to enroll, the student must withdraw any previously submitted applications and accept NYU's admission offer – roughly within 2-3 weeks of receiving an admission offer. Students are then restricted from filing any new applications as well. Providing that a student has completed the Early Decision Financial Aid application online, the student will be provided with a financial aid estimate soon after the student is offered admission. Again, admitted students will have roughly 2-3 weeks to review their financial aid package before confirming their enrollment at NYU. We believe that part of our commitment to Early Decision applicants is to provide an "early" decision, and as a result, we either admit or deny Early Decision candidates. Please note that Early Decision students who are denied admission may not re-apply as Regular Decision applicants. NYU uses the same methodology in providing financial aid for Early Decision candidates as we do in providing financial aid for Regular Decision candidates. Students are not offered more or less financial aid based on when they apply for admission. For Early Decision I candidates, we use information students share with us via the Early Decision Financial Aid Application online to provide admitted students with an estimated financial aid package after December 15. For Early Decision II candidates, we use this information to provide admitted students with an estimated financial aid package after February 15. Students are then provided with their official financial aid award in late April, assuming students have completed their Free Application for Federal Student Aid (FAFSA) by February 15. Students will only be released from the Early Decision agreement if they believe their estimated financial aid package does not enable them to attend. Students must be aware that applying Early Decision will not enable them to compare financial aid packages from other universities. If comparing financial aid packages will be necessary for a student, the student should apply under our Regular Decision program. NYU will still reserve the majority of our admission offers for students applying for Regular Decision, so students should not feel pressure to apply Early Decision if finances are of concern. As most students know, the biggest advantage to applying Early Decision is that if you are offered admission, your college search process can be completed early and thus, reduce a tremendous amount of anxiety over the college admission process. Many students want to know if it is “easier” to be admitted through our Early Decision process. The reality is that no, it is not “easier” to be admitted Early Decision, as the quantifiable criteria we use to evaluate candidates for admission – GPA and class rank (if available), test scores, etc. – is the same during both the Early and Regular Decision processes. Students who are offered admission during the Early Decision round will have remarkably similar credentials as those offered admission during the Regular Decision round and vice versa. That said, given the relatively small size of our Early Decision applicant pool, we have been, in recent years, able to admit a larger percentage of our applicants during the Early Decision round. Most recently, we were able to admit roughly 39% of our Early Decision applicants v. roughly 30% of our overall applicant pool. Complete the Common Application and NYU Supplement online and check either the Early Decision I or II option. Download and sign the Early Decision Agreement from the Common Application website. Secure the signature of your parent or guardian and your college adviser/guidance counselor. If you apply online, the Early Decision Agreement may be submitted along with your high school transcript. If you apply using the paper version of the Common Application, the Early Decision Agreement should be submitted with your application. Submit all supporting materials such as transcripts and standardized test scores to the Office of Undergraduate Admissions by the appropriate deadline. If you wish to be considered for need-based financial aid, complete the Early Decision Financial Aid Application online via the Early Decision Application Financial Aid Checklist. Early Decision applicants who do not file an Early Decision Financial Aid Application will not be considered for NYU need-based financial aid. Please note that the exceptions to our Restrictive Early Action policy have changed this year to include scholarship and other special programs. For quick reference, the changes are bolded below. 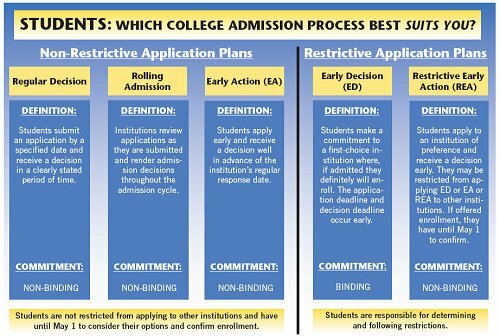 Applicants agree not to apply to any other private college/university under an Early Action, Restrictive Early Action, Early Decision, or Early Notification program. The student may apply to any college/university with early deadlines for scholarships or special academic programs as long as the decision is non-binding. The student may apply to any public college/university. If you are considering applying to another college/university whose application option does not appear to qualify as an exception, please call the Office of Undergraduate Admission at (650)723-2091 for clarification. Harvard College and a number of other institutions offer the Early Action option on the same timetable as Early Decision: a November 1 application deadline and a mid-December notification. There is, however, a significant difference between the programs: Early Action is non-binding, meaning that admitted students are not obligated to enroll. In contrast to some Early Decision colleges, Harvard does not offer an advantage to students who apply early. Historically, higher Early Action acceptance rates have reflected the remarkable strength of Early Action applicant pools—not less rigorous admissions standards. For any individual student, the final decision will be the same whether the student applies early or regular. There is no incentive whatsoever for Early Action colleges to admit weaker candidates early and then have to reject stronger Regular Action candidates. Diminishing the quality of the student body would be antithetical to the goals of the institution. If Harvard had seen an institutional advantage in using Early Action, it would not have eliminated the program for three years. You must send ALL application materials by this deadline for Early Action consideration. Please send us the Common Application or Universal College Application, the Harvard Supplement and the $75 application fee (or simple fee waiver request) as soon as you can and by October 15 if at all possible. This will allow us to create and begin processing your file. Students applying to Harvard under the Early Action program are not permitted to apply early elsewhere in the fall under Single Choice Early Action, Early Action or Early Decision programs. Harvard will withdraw any offer of admission to a student who does so. If I apply single choice early action to Harvard may I apply to another college's Single Choice Early Action program? If I apply single choice early action to Harvard may I apply to another college's Early Action program that is not single choice? No - unless the college is a public institution. If I apply single choice early action to Harvard may I apply to another college's Early Decision program? You may not apply simultaneously to Harvard's Early Action program and another college's Early Decision program. However, after you receive notification from Harvard's Early Action program (around December 15), you are free to apply to any institution under any plan, including binding programs such as Early Decision II. If I apply single choice early action to Harvard may I apply to another school's rolling admission program? Yes. You may apply to any college or university with a non-binding rolling admissions process. I am eligible for scholarships at my home state's institution only if I apply Early Action. Am I allowed to apply to Harvard Single Choice Early Action as well as to my state school? May I apply EA to another public institution if it is not in my home state? Yes. You may apply to any public college/university. I am also applying to colleges outside of the US – may I apply to them at the same time as I apply EA to Harvard? May I apply to another college under its Regular Decision plan before I receive from Harvard the admissions decision on my Single Choice Early Action application? Yes. You may apply in the fall to any institution under its Regular Action program. Students admitted under an Early Decision program at another college must withdraw any pending application to Harvard and are not eligible for admission. If you would like an admissions decision by mid-December, you may apply under Yale’s Single-Choice Early Action program. The program is like other non-binding plans in that candidates who are admitted early need not respond to the offer of admission until May 1, and may apply to other schools for Regular Decision. Being admitted to Yale early would, for example, still allow you to compare offers of financial aid in the spring. Yale’s Early Action plan is unlike many other programs in that if you apply for Single-Choice Early Action at Yale, you may not simultaneously apply for Early Action or Early Decision to any other school. If you apply early to Yale, you will be asked to sign the Single-Choice Early Action Agreement on the Yale Supplement stating that the only Early Action/Early Decision application you intend to file is Yale’s. For Single-Choice Early Action, the deadline to submit the Common Application and the Yale Common Application Supplement, along with the application fee or fee waiver request is November 1. Students will be notified of the admissions committee's decision in mid-December. Admitted students will have until May 1 to accept an offer of admission. The last of these, deferral, means that the admissions committee has deferred its decision and will re-consider your application along with the Regular Decision applicants. Deferred applicants will receive a final decision in April. Applicants denied admission under Single-Choice Early Action are not eligible for further consideration for admission during that application cycle. Single-Choice Early Action candidates are evaluated in the same way as are those who apply for Regular Decision. Senior grades are not often available for early candidates, so consider the strength of your record at the point of application and have all your testing completed by early November if you use the Single-Choice Early Action program. Although the Single-Choice Early Action submission deadline is November 1, we encourage you to submit your materials to us sooner. The earlier your application is completed - including the Common Application and Yale Supplement, the necessary school documents, and your fee or fee waiver request - the sooner we can begin to evaluate it. While this will not result in a competitive advantage for applicants, it will allow ample time for review of your application. You may apply to any college's non-binding rolling admission program. You may apply to any public institution in your home state at any time provided that admission is non-binding. Allows students to apply earlier in the admissions timeline—by November 1 of your senior year in high school—and receive a decision on admission earlier on in the process. The Early Action decision will be one of three: admit; defer for a final decision by early April; or deny. You do not need to apply EA, but this fast-paced approach may fit your needs by providing you with a decision before the end of the calendar year. It's a great option if you know that Michigan is one of your top choice schools. Please note: Undergraduate Admissions Application for fall 2016 will be available on August 3, 2015. You will receive notice of decision through your MyUA account on November 5, 2015 – You will also receive official notification in the mail. You will receive notice of decision through your MyUA account on or before December 3, 2015 – You will also receive official notification in the mail. Rolling admission will apply after these dates, you will receive a decision within 2-4 weeks.